So, I have a bunch of random/left-over/forgotten items that I haven't blogged about. First, PLEASE check out my sale! I try and post new things each week!! 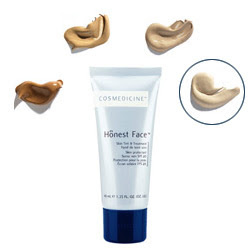 Honest Face Tint & Treatment for Fair Skin with SPF 20 is a skin perfecting tinted moisturizer that improves skin quality and provides SPF 20 UVA/UVB protection and antioxidants. Honest Face comes in four wearable shades and the the coverage is buidable. Honest Face for fair skin, the no BS tint & treatment cream. Vitamin E (Tocopheryl Acetate): Considered to be an antioxidant superstar. Allantoin: A botanical extract from comfrey root. Medical grade Allantoin, used in COSMEDICINE formulations, is a proven cell-healing agent that stimulates healthy tissue formation. It also helps promote the repair of photo damage and reduces UV induced inflammation. My first and only MUFE e/s- the most beautiful purple ever!!! #92. I forgot to post my new Gel Liner from JW Cosmetics. If you are looking for a bright, royal blue- then look no further! Oceanic is a GORGEOUS color!! Ever tried FUZE drinks before? Well, Joe and I are trying to drink more TEA, instead of coffee- he's winning this one. However, I got this at 7-11, and WOW it's yummy and very good for you!! equal to 2 servings of veggies??? nice! Joe and I went to the 99 Ranch Market to get some Pocky, and we saw the new "MEN'S" dark chocolate Pocky. YUMMY!!! I am a HUGE dark chocolate lover! Anyone tried this yet? It's so rich! YEAHH!! I LOVE FUZE drinks! it's not a tea, but you should definitely try the strawberry & guava one! it's so yummm!! but natural, so i'm sure you'll love it! oohhh! thanks for the in-depth review and info about Honest Face! you got me really curious now and i really want to try it! o.O and that JW gel liner is THE MOST gorgeous blue color i've seen! i want too!! *w00t* I'm a dark chocolate lover, I'm gonna try that Pocky! hehehe great haul, Whit....that Fuze drinks look interesting, I've yet to try. I love dark chocolate pocky. It's my favorite. More Cosmedicine!! :) Thanks for all the swatches!! That gel liner is just WOW!! Soo blue and just breathtaking!! Mmm... green tea! ANd pocky rocks!! :) YUMMMMMMOOOOO!!! I Love Fuze! I remember they sold a huge pack them at Costco or Sam's Club, sorry I don't remember, but it was one of them. I definitely miss eating Pocky. I haven't found a place in Atlanta, that sells them. But hope the dark chocolate ones taste as good as the milk chocolate and strawberry ones. Oooh that purple is soooooo pretty!!! I love it! It's so hard to find the right purple!! O man the tinted treatment looks great!! Haha thanks! I look so "not the same" in the picture! Congrats on trying to be healthy! I know I'm trying but it isn't going so well; I just ate a donut, brownie, and a pig in a blanket LOL! wow the blue IS gorgeous!!! so is the purple!! Whitzzzzz *hugs* I love the purple e/s! I've officially added it to my wish list ^_^. Whenever I make a trip to the school cafe, I always grab a Fuze drink and I'm definitely a green tea and dark choco addict! Haha. OoOooH Pockyyyyy. Holy that blue is NICE! It's so deep and shimmering! and whaaaa they have Pocky but men's version?? So it's manly poky?? crazy!! holy moley that is a gorgeous blueee. and ahhh mufe eyeshadow #92! THAT IS BEAUTIFULLL!